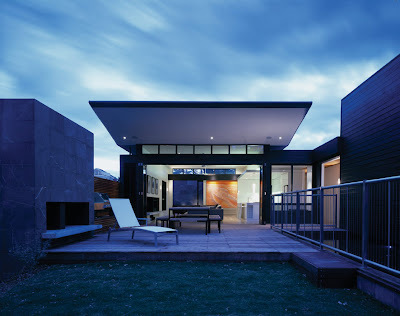 Wolveridge Architects bring us a unique modern bach for a retired couple, that proves modern design can accommodate all a client's needs without compromising on style. The Sorrento House was designed for a retired couple as a holiday house and a place they and their extended family could retreat from urban life. 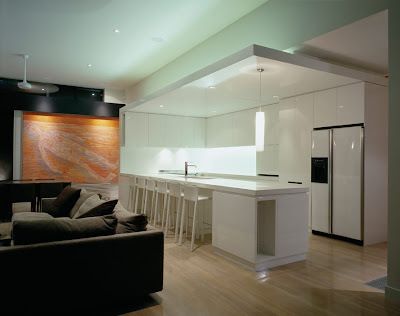 Located in a beach side suburb near Melbourne, the client's requirements were fairly straight forward. Four bedrooms, open living areas, a separate place for the grandchildren to play and to be private. After removing the existing house the basin like nature of seaside plot was revealed. 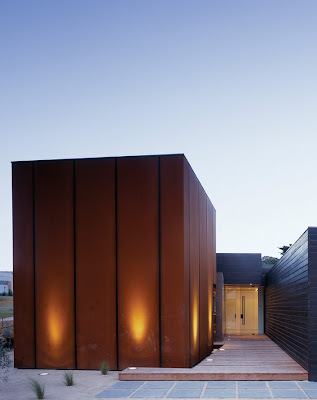 Setting out, the idea of security and privacy was achieved through two monolithic structures at the rear of the house. The solid black wooden garage and rusting steel box, materials chosen for longevity in these conditions, face the street corner. Windowless on 3 sides, these boxes act as guards to the main door, the entrance to the contrasting open plan rear of the house. As requested, the grandchildren have been given their own play area, the tall steel box at the entrance of the residence. At the opposite end of the house, the master wing, separate for the main living area is a quiet retreat, with the lap pool along it's length. The master bathtub, focal point at the end of the main corridor, can be closed off on weekends when the couple aren't alone. Between the two wings lies the third and fourth bedrooms, kitchen and main living area. The open plan living area, is a breeze space that opens onto a large deck with lap pool to left and protecting fireplace and BBQ wall to the right. This acts as a buffer/ interim space in the all important indoor - outdoor flow. 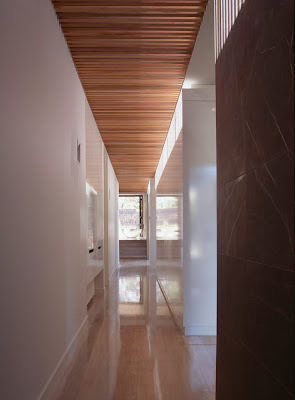 A lesson from this house, is how the architects have used glass sparingly. Heading from south-west to north-east and the rear of the section, the house opens up to the sun. The living area, used all day, has large northerly windows. The bedrooms and bathrooms used at night, have narrow glazed apertures, yet seem light and airy as white enamel paint reflects the light throughout. This finishes off a house of contrasts: from dark wooden exterior panels to the light white interior, steel and wood entrance guards, fire and water separated by the deck, and the night and day segments of this fantastic house.